Sorry, I forgot to bring something to use as a size comparison, so I went with a 16.9fl oz water bottle... or just look at the size of the spoon compared to the size of the dessert. Anyway, I went with an M&M blizzard and it turned out quite colorful. I don't even remember the last time I had just a plain M&M blizzard (4 or 5 years maybe). I definitely enjoyed it though. Rather than the hard, split, full size M&Ms you find in a twisted frosty, these were heavily chopped up mini M&Ms and they gave up some crunch while not being too hard (you know how frozen M&Ms can be). UPDATE: I was reminded that while eating this treat, I had wished for a few more M&Ms in my cup so that way the M&M flavor would have been a bit stronger. 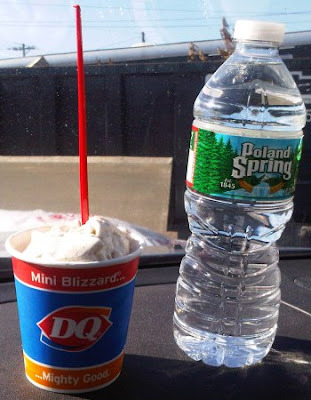 Actually, let me put it other way for all those parents out there: Rather than feeling guilty about giving my daughter a 600+ calorie blizzard, or alternatively, rather than feeling guilty about taking said blizzard from said daughter before she devours said 600+ calories, I can now get her a mini and we're both happy. Check out GrubGrade's Post from a few weeks ago. It includes two (awful) commercials about the mini. I just had one of those a few days ago! For me, i would rather have the full size m&m's. The chopped don't taste like m&m's. No, that's a good point. It's definitely a more mild flavor this way... reminds me that I had actually wished for a few more larger m&m bits in my mini blizzard. I'm all about this new size. It's a great way to have a treat rather than a huge indulgence.